At the beginning of the month, we reported the results of a study by New York’s Hunter College that assessed which airlines had the best food. While Virgin America took top honors, Delta Airlines came in a close second for its low-calorie and vegan options. While having high marks on food quality is nice, many fliers today must pay extra for an in-flight meal if they’re flying coach and going on a long flight. However, Delta has recently said that it will be testing complimentary meals for coach passengers on some transcontinental flights. “Delta is currently testing complimentary meals in the Main Cabin on Transcon flights between New York-JFK and Los Angeles International Airport/San Francisco International Airport as part of the airline’s focus on continually looking at ways to enhance the on-board experience for customers,” the company said in an announcement. Depending on what time travelers are flying, they could be treated to one of a few meal options. For those flying in the morning, the company says that participating flights will be offering a Maple Breakfast Sandwich or the Luvo Breakfast Medley. Those flying in the afternoon can choose from a Mesquite-Smoked Turkey Combo with chips and a brownie bite or the Luvo Mediterranean Whole Grain Veggie wrap, which comes with grapes and a cookie. While many airlines have begun restricting certain free amenities on flights in order to charge a premium, Delta’s possible inclusion of a free meal could mark a reversal. 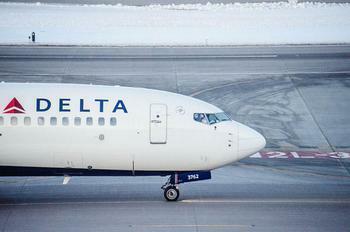 Delta Senior Vice President of In-Flight Service Allison Ausband says that the company is trying to improve the flight experience to meet consumer demand. “We are constantly actively listening to our customers and employees, gathering their feedback and testing new products on board to continuously improve the overall experience. Testing meals on Transcon flights is part of our commitment to be thoughtful about our offerings and make decisions based on customers’ needs,” she said.